Born in 1931, incarcerated in 1963 and released in 1981. Now 80-years old, Dr Lim Hock Siew, sits quietly, his wife by his side, as members of the Singapore Democratic Party (SDP) and guests pays tribute to him. The venue? A recent party celebrating Singapore's 46th year of nationhood at Fort Canning. Dr Lim listens attentively as Dr Wong Wee Nam, a family physician, relates his admiration for Singapore's second-longest serving ISA detainee, who served 18 years behind bars. "I had heard of him when I was a young boy," Dr Wong says from the podium. "He was the son of a famous fishmonger in the market where I had lived." Dr Wong recalls how Dr Lim, who later became a doctor himself and was well known in the area, would dispense free medicine to the needy and how he would also give his patients money for transport so they could get home. "This is not surprising from a doctor who believes that the most common cause of anaemia is not iron deficiency but poverty," Dr Wong says, his speech interrupted several times by applause from the 100 or so guests. Dr Lim, then 32-years old, was arrested and incarcerated under the Internal Security Act (ISA) in Operation Coldstore in February 1963 for being "a security threat to Singapore's interests", a charge he has always rejected. He was released in 1981 — after having served almost 20 years in detention. Only Mr Chia Thye Poh, who was detained in 1966 also under the ISA, served a longer term — 23 years in detention and a further 9 under house arrest. Under the ISA, detainees are not required to be produced before the courts. Dr Lim thus never had the opportunity to defend himself from the charges brought by the state. Even when he tried to speak up about his detention at an innocuous book launch event, the video of his speech — recorded by filmmaker Mr Martyn See — was banned by the authorities. The film "gives a distorted and misleading portrayal of Dr Lim's arrests and detention under the Internal Security Act (ISA) in 1963," it said. Mr See was also instructed to "take down all digital copies of the film on Youtube" and on his personal blog. However, the Internet affords one to view the film on alternative channels and since the ban, many more have viewed it. "Perhaps there is a reason (for the ban)," Dr Wong tells the audience. "The video is in danger of changing people's perception of Dr Lim Hock Siew. He comes off as a very calm and dignified person. There is no anger or bitterness. His intellect is intact and his mind is clear." Accompanied by his wife, Dr Beatrice Chen, a nephrologist or kidney specialist, Dr Lim sat stoically as Dr Wong ends his speech and the audience rose in ovation and applause. 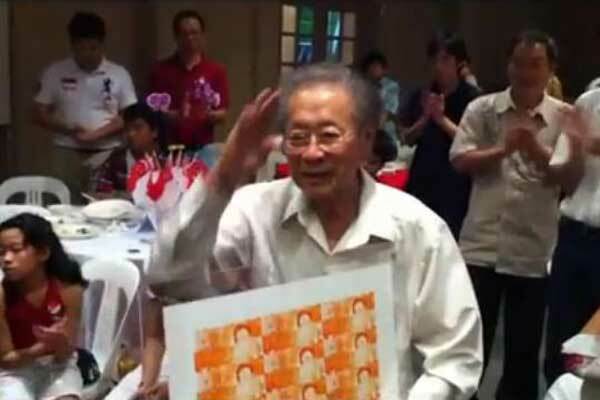 Dr Chee Soon Juan, secretary-general of the SDP, then presents Dr Lim with an art piece donated by a member of the public. As cameras flashed, Dr Lim — dressed in a white long sleeve shirt and dark pants — smiles and shakes hands with several well-wishers while uttering "thank yous". "I think it's a long time coming," Dr Chee says when asked about the reason for honouring Dr Lim on Singapore's National Day. "My only regret is at we didn't do it earlier for a man of his integrity and resilience, and overall honesty and courage of his beliefs. I think he should have been honoured a long time ago. What we have done is just a very small gesture." Dr Chee recalls that Dr Lim's son was only about 5 months old when Dr Lim was detained. By the time he was released, his son had gone on to college. "That kind of sacrifice is something which I think very few people can really (understand)." "On this occasion of our National Day when we all say, oh we love Singapore, this nationalistic kind of fervour, what does it mean for somebody like Hock Siew?" Dr Chee asks. "I think it goes deeper than this jingoistic kind of feelings. His love for Singapore is very different from what we can understand." Dr Chee hopes there will be some kind of process whereby former detainees, such as Mr Zaid Zahari and Mr Chia Thye Poh, can tell their sides of the story. "Singapore owes it to them. To restore their honour and good names and acknowledge their sacrifices for this nation," said Dr Chee. Dr Lim's experience is also instructive for younger politicians like the SDP's Dr Vincent Wijeysingha who led a Group Representation Constituency (GRC) team against the ruling People's Action Party's (PAP) in Holland-Bukit Timah GRC in the May elections. "Firstly he represents to me the mobility of the human spirit, that you're able to withstand that kind of sacrifice," said Dr Wijeysingha, the son of former Raffles Institution principal, Eugene. "That sense of dignity to yourself, that you're not going to agree to something that you haven't done. Second thing that he represents to me, the kind of belief, an understanding, that people are able to act in ways that go beyond their immediate satisfaction of needs… They are able to put higher virtues ahead of their own needs." "I think if we want to look at who are the real heroes of Singapore, we look at those people who show us what it means to be human. And people like Dr Lim show us what it means to be human — courage, dignity, honour." Perhaps the evening meant more to one former detainee, other than Dr Lim himself. Mr Vincent Cheng, a quiet and soft-spoken man with an ever-ready smile, was accused by the Singapore government of being the "ringleader" of a "Marxist conspiracy" in 1987. He has alleged physical and psychological abuse by the authorities during his detention, which lasted a total of three years. Like Dr Lim and the earlier detainees, Mr Cheng — who was a social worker when he was arrested in 1987 — and his colleagues who were incarcerated were never charged in open court or afforded any opportunities to defend themselves. In 2010, he was barred from speaking at a forum at the National Library which was organised by the National University of Singapore History Society. "I am very happy that the community is publicly acknowledging the contribution of Dr Lim Hock Siew to the development of Singapore," says Mr Cheng, now in his sixties. "His personal sacrifice is to be commended and cherished. In doing so, we also do not forget the commitment and contribution of his other comrades to Singapore's history." Like the SDP, Mr Cheng calls for the abolition of the ISA and "for a Truth and Reconciliation Commission to establish justice for all who suffered under the ISA." Perhaps such a commission may never come to pass but in the meantime, however, Dr Lim and former detainees can find consolation that more and more younger Singaporeans are becoming aware of their experiences and have started to question the events and backgrounds leading to their arrests and detentions. Dr Lim's greatest contribution, ironically, could be his lengthy incarceration. It continues to shine a spotlight on the ISA law in Singapore, even decades after he was first detained. "In a sense they (the detainees) kept a kind of flame of humanity alive even when people were being told in Singapore that all that mattered was our material needs," Dr Wijeysingha says. "People like (Dr Lim) in the background reminds us of what it means to be human and they make us proud to be Singaporeans. You often hear about people like Nelson Mandela, Gandhi outside of Singapore but right on our doorstep, Dr Lim and Mr Chia Thye Poh — the longest-serving political prisoner in the world — these are Singaporean men. Something to be proud of." Andrew is the co-founder of a socio-political website and writes frequently on issues which are close to his heart, particularly those affecting the less fortunate and on Singapore politics.